Can I use the bin-to-iso tool in the business area, ergo commercial! Yes you can use the bin-to-iso tool in the business area, ergo commercial on all Windows OS! The bin-to-iso solution is written not only for newest OS Windows 10, However, you can use this bin-to-iso, solution without disadvantages on earlier versions of Microsoft's Windows operating systems whether it's a Windows desktop, tablet, Surface Pro / Go, or even a server operating system. It is sometimes necessary to use this BIN2ISO convert in business or office, for commercial occasions, a simple yet effective tool, use it and get in touch with fact converter benefits that makes much more fun, on the new MS Windows OS, or on any of the old MS operating systems. The free conversion utility was created for fast conversion tasks, from any BIN to any ISO file! ► ... the latest and fastest version of BIN to ISO file converter! (Image-1) An example commercial.bin to business.iso! As you can see above in Windows 10 shot screenshot, it's a simple yet effective and fast conversion tool, especially in the case of BIN to ISO conversion. The bin-to-iso tool can also be used in the business, government and commercial sectors and will be easy to use at home on the home PC! 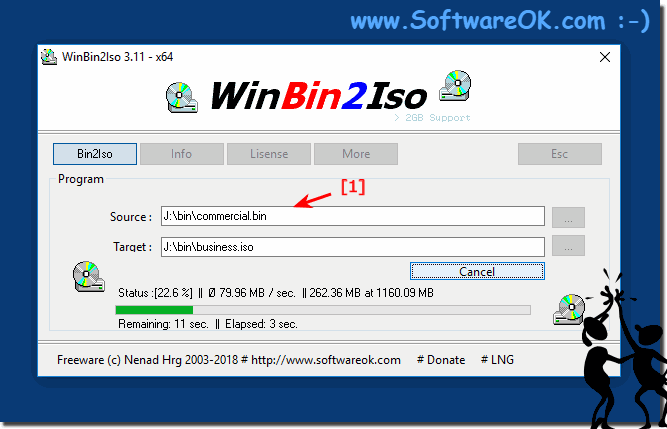 WinBin2Iso - FAQ-3: Can I use the bin-to-iso tool in the business area, ergo commercial!